Which micro-holiday is your favorite and why do you like it? These are the original 12 micro-holidays. I think you can add “Pirates’ Day,” September 19, and “The Great Gnomeregan Run,” October 12 to this list. The former coincides with “International Talk Like a Pirate Day.” The latter has been on the day of “The Running of the Gnomes” run for breast cancer awareness. Luminous Luminaries on July 13th. This involves Vash’jr. Free T-Shirt Day on August 16th. Special vendors will be in Orgrimmar and Stormwind handing out shirts we get to keep. Wanderer’s Festival on December 7th. This will involve Krasarang Wilds. I like micro-holidays. They break up the year, provide a needed bit of levity, and aren’t hard to do. I would like a Feat of Strength achievement when I do all of them. Since they are just a diversion and — if you aren’t paying attention to the overall calendar, you might miss them — an achievement with the name “I did all the micro-holidays and all I got was this lousy achievement” would be a nice way to recognize your participation. I missed the balloon festival and the boat bash. There were other things to do and the “micro” usually means one 24-hour period — if you’re off doing something else or not playing you won’t see these, but that’s the point. They are small events which show up and disappear. You get nothing for participating other than fun or a gnarled piece of driftwood that looks a bit like me — a gift from Steve. 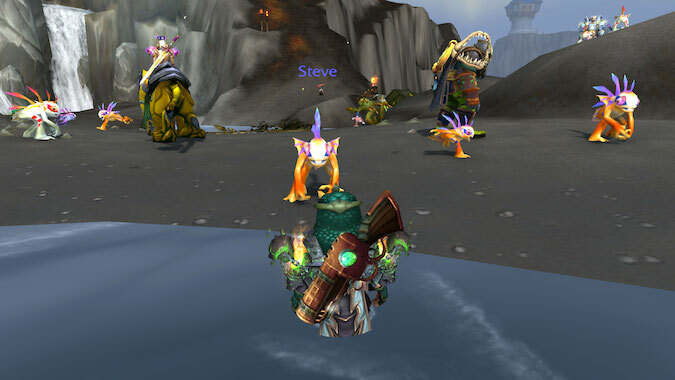 My favorite is the Auction House Dance Party — although, if I could make Steve akin to my guild herald, I’d like March of the Tadpoles better. It’s just a fun way to spend an hour, particularly with guild members. I think the new additions to the list will be exciting — although I’m a bit leery about going to Vashj’ir. It’s just not a likeable zone. Maybe I’ll have a better opinion of it when I’m doing something more fun than trying to find Azshara’s Veil. Are you participating in the micro-holidays? If you’re not, why not? If you are, which one — so far — is your favorite and why do you like it? Finally, which one are you looking forward to of the three new ones upcoming?